The guest rooms are named after streets in the Historic Parkside neighborhood, and the room with a great view of Woodward Avenue through a breathtaking wall of windows is The Woodward Room. A spacious master suite with a king sized bed, and a sitting area with both a couch and a love seat, some might remember having apartments smaller than The Woodward Room. More than a mere sleeping chambers, there is a great expanse of space for work and study, or just a private place to relax with the plasma television or the wireless internet on your laptop. 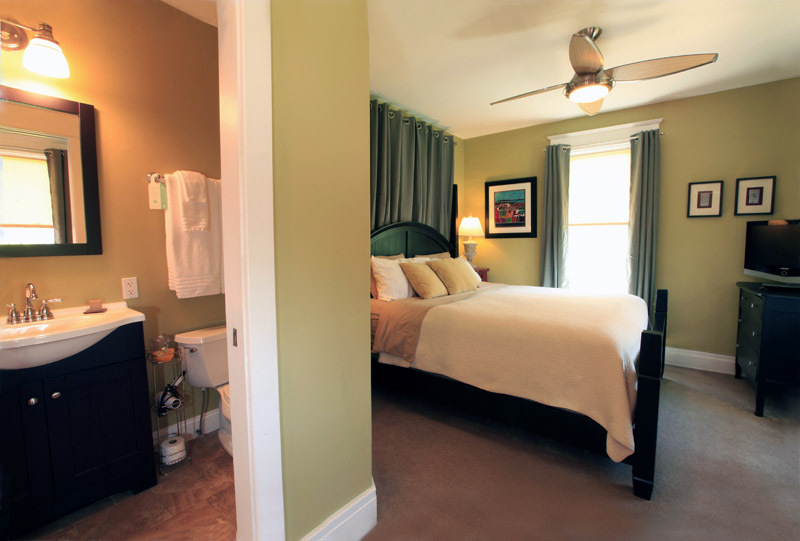 Within the suite is a private bathroom with limestone walls. The tumbled stone shower floor is sure to give you a sensational feeling after a long day. And don’t discount that view. Well maintained and beautiful turn of the century homes and gardens as far as the eye can see. Arts and Crafts bungalows, American Four Squares, Victorians, all set on the Frederick Law Olmsted designed curvilinear streetscape out of your private bank of windows. 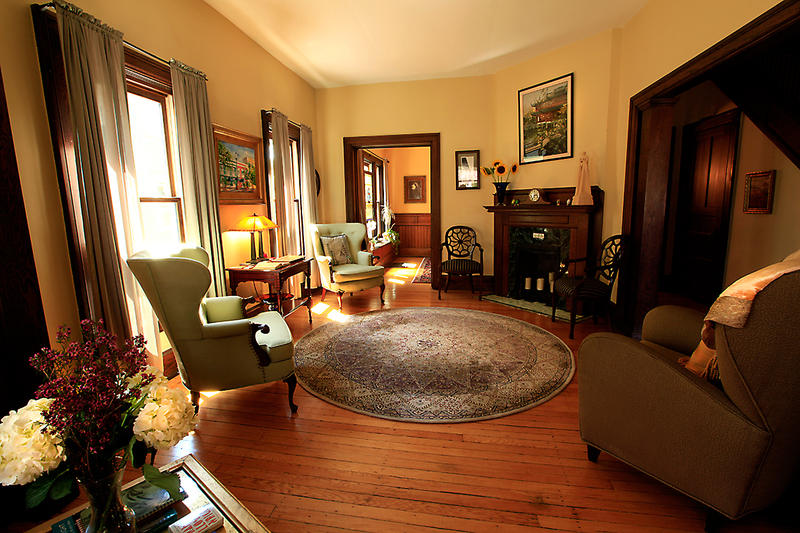 Named after beautiful Jewett Parkway at the heart of the Parkside neighborhood, The Jewett Room is a Mission style room, filled with Mission accents and furniture. 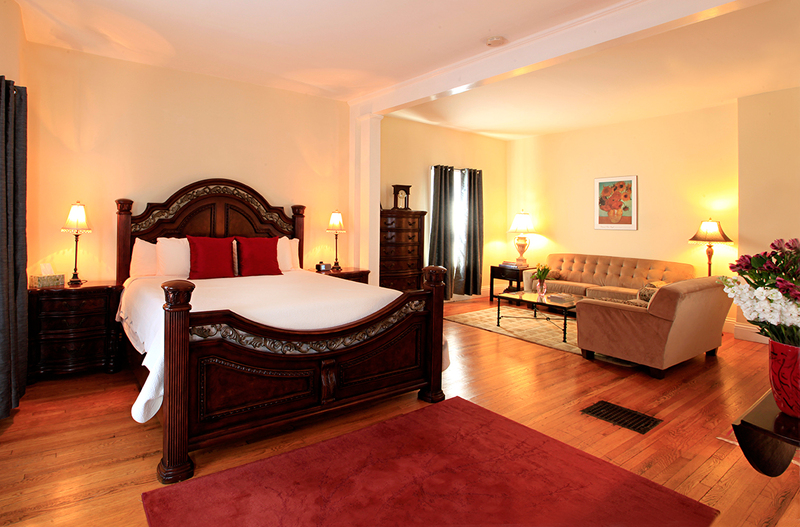 A very comfortably sized space, The Jewett Room has queen bed with a Mission headboard, a Mission style desk, and a soft chair for some private relaxation time. The room also features a plasma television and wireless internet access. This wonderful room is connected to its own private Master Bath, (see more information on below). The smaller space, softer ambient lighting and linear Mission details inspire a more contemplative mood than The Jewett Room’s next door neighbor, The Woodward Room. The original claw foot tub anchors the master bath, but the heated floors will make you want to spend extra time getting ready in this spacious bathroom. 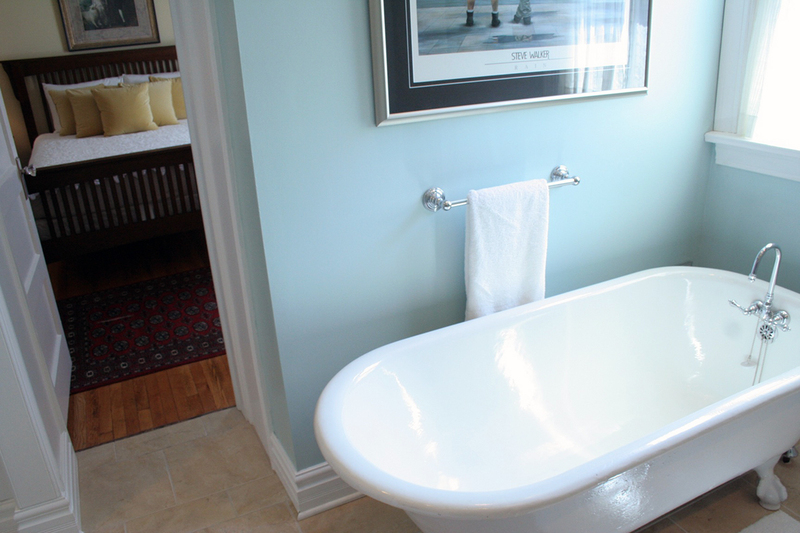 And while the claw foot tub is a great piece, most of us don’t have time to soak in the tub anymore. That’s where the marble-walled walk-in 7 x 6 shower with multi jets makes for a stress-relieving way to wash up. 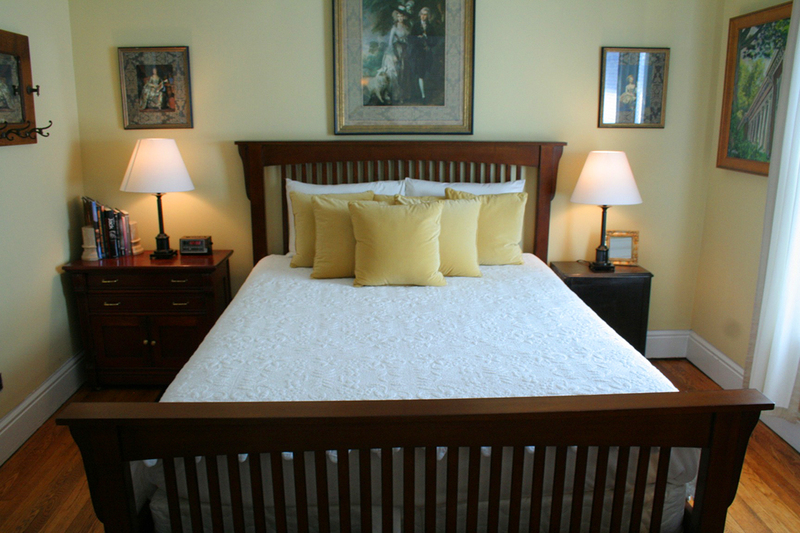 The Summit Room is located at the back of the House and has a King size poster bed that has the most comfortable mattress for a perfect night sleep. There is also a writing desk that looks out over the beautiful landscaped yard. 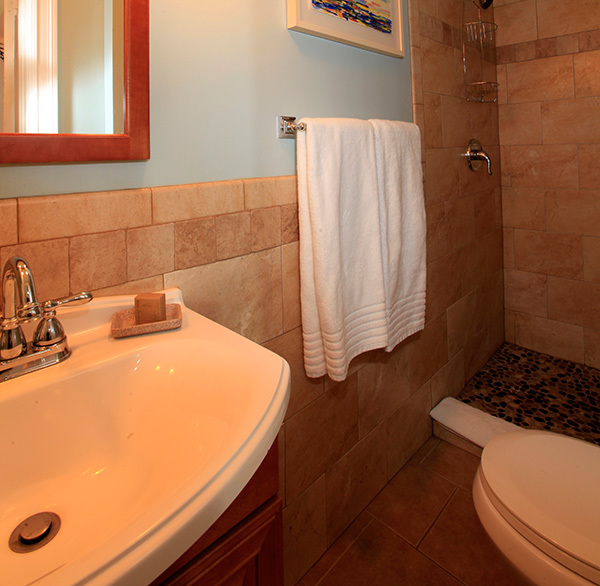 The Summit room has a private bathroom within the suite. A great place for relaxation and quiet contemplation, reading a book, or some soft music at the end of long day. 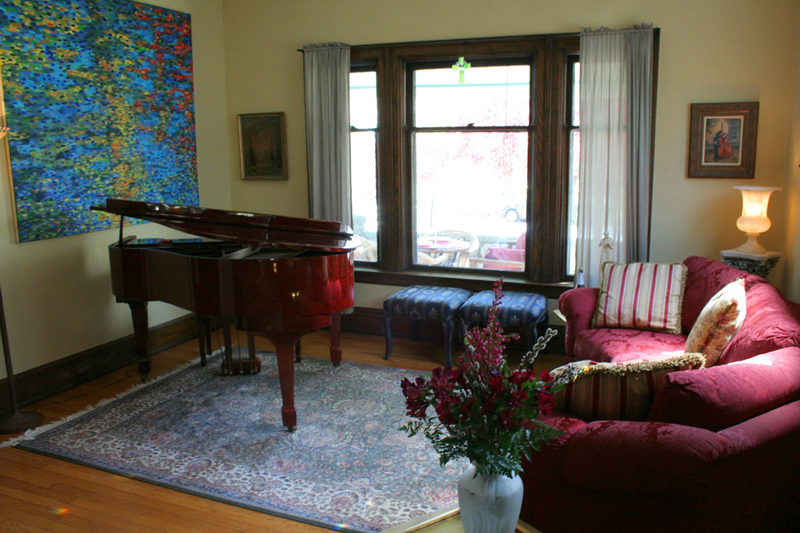 Chris says, “With the piano, this room is perfect for music and entertaining.” The room is anchored by the black baby grand, and the vibrant large canvas of blues and greens behind it. The big windows of the room open to a great view of the Parkside neighborhood streetscape, as well as the beautiful Medina sandstone masonry work of the front porch. The room fills with light, which only adds to the spacious feeling created by 11 foot high ceilings; and natural chestnut woodwork throughout give an old world class and charm to every room. Separated from the music room by a beautiful walnut architrave walkway, the living room has a cozier, more intimate feel with comfortable chairs dotting the circumference of the plush round rug in the center of the gorgeously restored hardwood floors. The open invitation to sit and relax is reinforced by one of the homes most artistic and warming original details– In the Northwest corner of the room sits a stunning green-tiled antique fireplace. 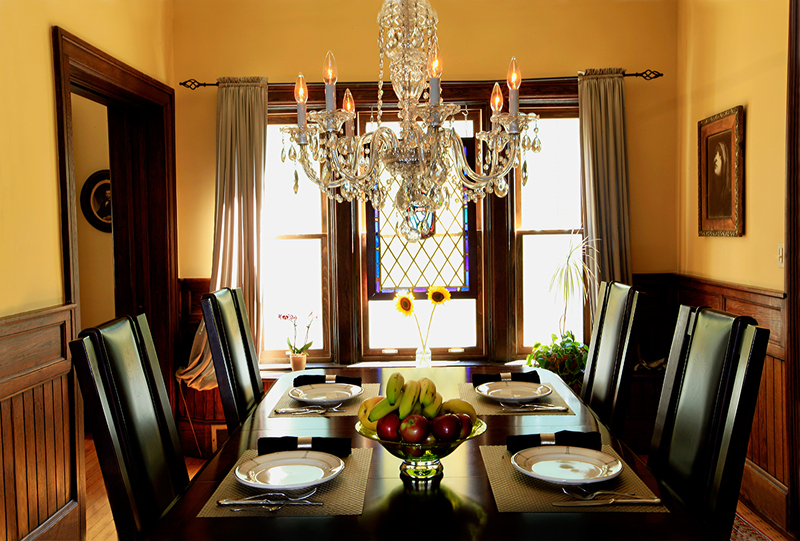 The formal dining room is another of the many eye-popping spaces at The Parkside House. Opulent chestnut wainscoting graces the walls, giving a regal flair to the breakfast portion of your bed and breakfast experience. Sitting at the massive table leaves guests wondering what it must have been like to be a member of one of Buffalo’s wealthy families around the time of the 1901 Pan-American Exposition, held only 5 blocks away. At the back of the house is the Great Room / Family Room / Kitchen. 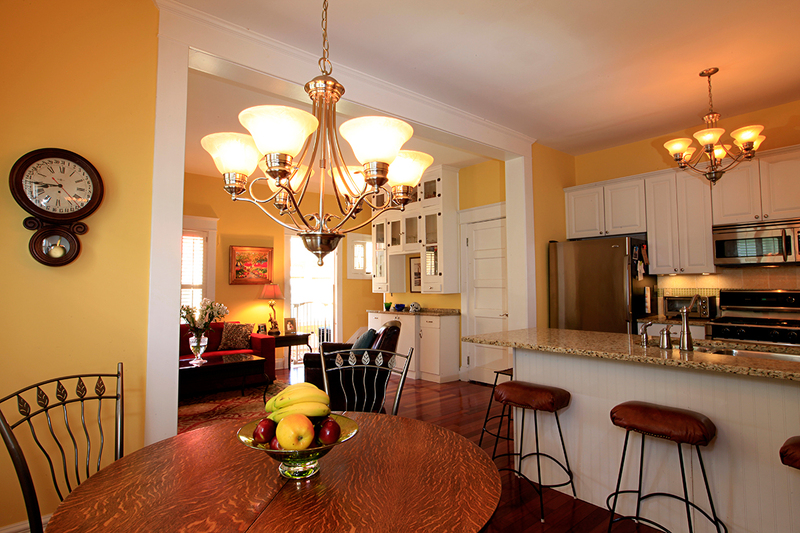 Its the first room that you realize Chris’ skill in not only renovation and restoration, but also in building a thoroughly modern, well-tooled kitchen, while still maintaining all of the allure of a house well over a century old. It’s a functional, bright room which reverts to Chris’ private area after breakfast has been served each morning.